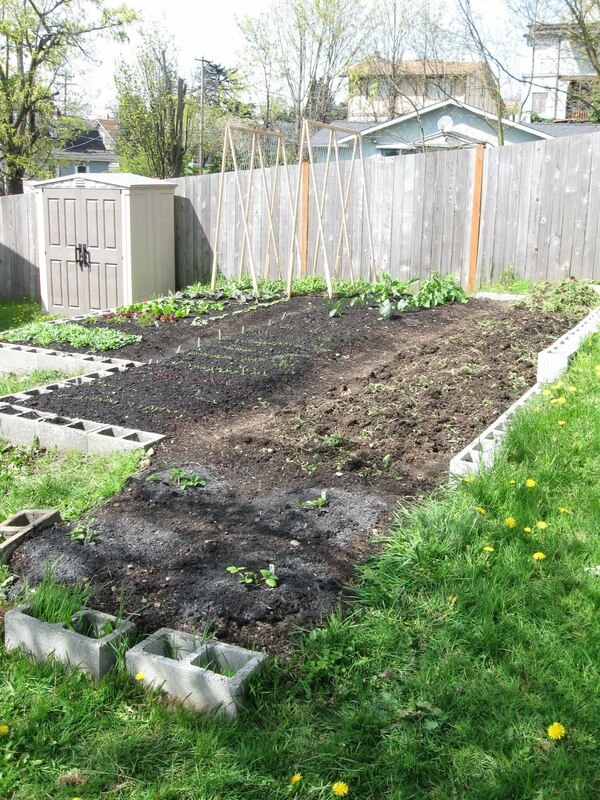 Fertilized everything with liquid fish emulsion yesterday and spread compost around the strawberries. The raab is harvestable, though I don't want to harvest too much lest I stunt its growth into the season--just picking the buds before the flowers open. The radishes will be ready in a week or two. The carrots and beets have had their first round of thinning, just to keep them from "bumping." 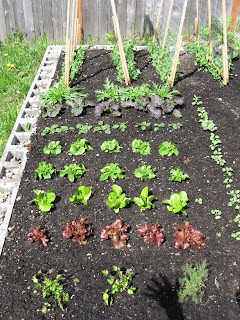 The mesclun mix can be harvested with scissors in the next week or two as well, especially I think if we get more sun. The soil looks wonderful. Yesterday when the sun was shining I chopped up the rest of the clover on the summer bed, leaving it on top to dry as best as possible. We had pulled and piled a bunch of it already, so I raked all that aside into a pile, and in a couple weeks will rake it back over the bed and dig it into the soil. The starts are big and lush--at least all those that were started in potting soil as opposed to seed starter mix. They spent their first day on teh deck yesterday, some in sun and most under the shade of the picnic table.